What: The Rattlers and Empire face off in a critical Intense Conference match-up. Note: Arizona's last trip to Spokane was a 52-45 loss on July 17, 2015. The Rattlers are 6-4 overall, 4-1 on the road and 3-1 in conference play. Arizona is coming off a 34-32 road win over the Cedar Rapids Titans on May 5. They are averaging 49.1 points per game (3rd in IFL) and are allowing 42.4 points per game (6th). The Rattlers are second in the Intense Conference. The Empire are 7-3 overall, 4-1 at home and 6-1 in conference play. Spokane is coming off a 32-62 road loss to the Sioux Falls Storm on May 6. They are averaging 44.9 points per game (5th) and are allowing 40.4 points per game (4th). The Empire are first in the Intense Conference. The 2017 Arizona Rattlers have had more ups and downs in recent memory. There's something to be said about how good the team is, as the team has won 4 of their last 5 games (6 of their last 8) after beginning the season at a surprising 0-2. Arizona is keeping pace in the Intense Conference, but just when you think they're a dominant team, they have a game in which they struggle against the worst team in the league. 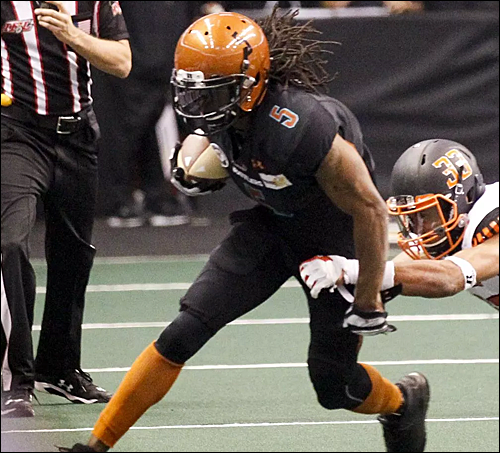 That was the case last week against the Cedar Rapids Titans, as the Rattlers hung on late for a narrow 34-32 victory. This week's game against the Spokane Empire is a tremendous one for the Rattlers, who dropped the first meeting 51-60 just three weeks ago. The top spot in the Intense Conference is on the line, and the Rattlers are going to come at the Empire with everything they have. It could be good timing for the Rattlers, as the Empire have struggled on offense the past two weeks. However, this year's Rattlers team is a hard bunch to figure out; will they be the high scoring team that scores over 60 points, or will they be the low scoring, grind it out team that has three victories of 39 points or less? QB Cody Sokol has had a good run since taking over for ex-AFL QB Darron Thomas. In 6 games, Sokol's completed 80 of 135 passes for 923 yards, 20 TDs and 5 INTs. Statistically, however, Sokol has had troubles on the road. He's passed for 589 yards, 15 TDs and 2 INTs in home games, but has only thrown for 334 yards, 5 TDs and 3 INTs on the road. Last week was a prime example of his struggles on the road, completing 9 of 15 passes for 67 yards and 2 INTs. If the Rattlers want to pile on the points, Sokol is going to have to step up his game against a stout Empire defense. In the previous meeting, Sokol completed 22 of 34 passes for 252 yards, 6 TDs and 1 INT. Despite his struggles in the 4th Quarter, Sokol was having his way passing the ball against Spokane's talented defensive backfield. He'll need a repeat performance of that to put the pressure on Spokane's struggling offense, and to silence Spokane's 9th Man. RB Darrell Monroe has been successful this season for the Rattlers, rushing for 459 yards and 11 TDs. He will need to keep up the positive momentum as he faces an Empire defense that stuffed him in the first game. Monroe, who ranks 1st in the IFL in yards per game (56.9) and 2nd in yards per rush (5.3), struggled to find any consistency in the previous meeting. It was his worst statistical game of the season, rushing 5 times for -4 yards. Arizona’s rushing offense ranks 2nd in the IFL, but they couldn’t gain any traction against Spokane’s 2nd ranked rushing defense. Getting Monroe going will be vital to the success of the Rattlers’ offense. Leading WR Anthony Amos (36 receptions, 440 yards, 13 TDs) looks to have another big game against Spokane. Amos, who returns to Spokane Arena for the first time since he was a member of the Spokane Shock in 2015, had his biggest game of the season in the first meeting, catching 5 passes for a season high 77 yards and 3 TDs. Fred Williams (32 receptions, 325 yards, 5 TDs), also had a big game in the previous meeting with 7 receptions for 61 yards and 2 TDs. The two took advantage of miscommunication from the Empire’s defensive backs, and will try to replicate that once again. Focusing on Williams and Amos could free opportunities for backup RB Jamal Miles, who has made an impact as a receiver this season with 32 receptions for 304 yards and 6 TDs. Ex-Empire WR Diondre Borel (4 receptions, 29 yards, TD) was inactive for the previous meeting, and could be active in his return to Spokane. Arizona’s defense will have to step up and try and take advantage of a Spokane offense that has struggled to find its groove passing the football in recent weeks. DBs Adam Sauder (66 total tackles, 2 tackles for loss, 5 pass breakups), Arkeith Brown (58 total tackles, 4 INTs, 7 pass breakups),Allen Chapman (38 total tackles, 4 INTs, 4 pass breakups), and Nathan Lindsey (25 total tackles, 1 pass breakup) will look to handle Spokane’s wide receivers, which have been on-and-off with their route timing this season for QB Charles Dowdell. DL Chris McCalister, returning after a short stint on the Rattlers’ Short Term IR, returns this week to put the pressure on Dowdell. He leads the team with 4.- sacks and 8 tackles for loss. Look for McCallister, Edward Mosley (19 total tackles, 0.5 sacks), Joshua Gordon (35 total tackles, 2.5 sacks, 8 tackles for loss) and LB Justin Shirk (30 total tackles, 1.0 sacks) to force pressure on Dowdell and to contain Spokane’s running duo of RBs Trevor Kennedy and Mulku Kalokoh. If the Rattlers can force turnovers and capitalize on points on the ensuing drive, they could leave Spokane in first place in the Intense Conference. How will they respond? It’s the question surrounding the Spokane Empire heading into Friday night’s tilt against the Arizona Rattlers. After a narrow victory over the woeful Salt Lake Screaming Eagles, Spokane needed to have its ducks in a row going up against the Sioux Falls Storm. The Empire hung in with their inter-conference rivals in the first half, trailing 21-14 at the half. Spokane kept within striking distance midway through the 3rd Quarter, trailing 28-20 with 6:38 left to go in the game. But struggles on offense and failure to convert on 3rd and 4th down would give the Storm favorable field position. After a promising first half, Spokane would lose by 30 points as the Storm won 62-32. With a blown opportunity for an upset, and Arizona’s two-game winning streak, it sets up for a critical must-win Friday night. QB Charles Dowdell needs to bounce back after a disappointing effort against the Storm, where he struggled to get into rhythm, completing 8 of 19 passes for 84 yards, 2 TDs and 1 INT. He was also under pressure throughout the game, as he was sacked a total of 3 times. With a Rattlers team re-building its confidence, Dowdell has to get back to playing like the Second Team All-IFL player he was last season. Over the past two games, he’s thrown 4 interceptions and struggled with his accuracy. He’s been successful in the Empire’s ground game, leading the team with 379 rushing yards and 9 TDs, but has to show the same success in the passing game. He was brilliant in the first meeting against the Rattlers, completing 13 of 24 passes for 204 yards, 6 TDs and 0 INTs. He’ll have to protect the football, and not force plays, if the Empire want to build on their lead in the Intense Conference. The Empire’s recent struggles in the passing game doesn’t all fall on Dowdell; better communication with his wide receivers will be a big key to Spokane’s offense finding success. Although Bryan Pray (37 receptions, 409 yards, 12 TDs) has come on strong over the prior four weeks, he was held to 1 catch for 14 yards last week. The success of Devonn Brown (32 receptions, 349 yards, 8 TDs) and Samuel Charles (21 receptions, 304 yards, 8 TDs) should allow for Pray to play a big role in the passing game. Last week, Charles had his best game of the season, hauling in 4 passes for 63 yards and 3 TDs while Brown saw his least productive, catching only 1 pass for 6 yards. Bouncing back for both Brown and Pray should make things easier for their quarterback. One thing that has not been looked into for the Empire’s offense so far has been the utilization of RBs Trevor Kennedy and Mulku Kalokoh. Kennedy, while technically listed in the RB role for the Empire, is a converted wide receiver. Utilizing his skills at receiver, where this season he has 13 receptions for 149 yards and 3 TDs, could allow for Kalokoh to see the field at the same time. The combination of Kennedy (42 rushes,151 yards, 5 TDs) and Kalokoh (48 rushes, 200 yards, 6 TDs) could be just what the Empire need to get their offense back on track. With two important playmakers in the backfield, especially one as dynamic as Kennedy, the Empire should take advantage of their skills. Kennedy and Kalokoh on the field at the same time could take the pressure off Dowdell and open up opportunities in the passing game for their top three receivers. Defensively, Spokane’s defense has been a major force in the team’s 7-3 record. LB/DL Andrew Jackson has stepped up his game in recent weeks, as he leads all Empire defenders with 65 total tackles while adding on 4 sacks, 9.5 tackles for loss, 4 pass breakups, and a fumble recovery. He will likely get the start for LB Nick Haag (53 total tackles, 4.0 sacks, 6 tackles for loss), who is attending a minicamp tryout with the NFL's New York Giants. With Jackson on one side of the defensive line and J.D. Griggs (31 total tackles, 8.5 sacks, 11 tackles for loss) on the other, they’ll have to put the pressure on Arizona QB Cody Sokol, who has struggled on the road this season. Harold Love III (17 total tackles, 1 sack, 3 tackles for loss) will be tasked with stuffing the middle of the line, and look for another dominating performance of shutting down the Rattlers’ run game. Should the Empire get the pressure on Sokol and shut down Monroe, it’ll be up to DBs Robert Brown (42 total tackles, 3 INTs,, 10 pass breakups), John Hardy-Tuliau (58 total tackles, 3 INT, 3 pass breakups), and Tyree Robinson (47 total tackles, 2 INTs, 4 pass breakups) to contain Arizona’s talented wide receivers. The defense got a huge blow as DB Adrian James (12 tackles, 3 pass breakups) signed with the CFL’s BC Lions. Newcomer Qua Cox (3 total tackles, 1 pass breakup) will have to step up in a substitution role to replace James’ void. Expect for LB Pasquale Vacchio (57 total tackles, 3 INTs, 7 pass breakups) to patrol the center of the field in a zone defense, limiting the Rattlers to short amounts of yardage in the middle. Taking advantage of the 9th Man, limiting turnovers, and better efficiency on offense will be critical for the Empire. If Spokane can limit the turnovers, whether by interceptions or by failure to convert on downs, and their defense has another big game, the Empire should cushion their lead in the Intense Conference. 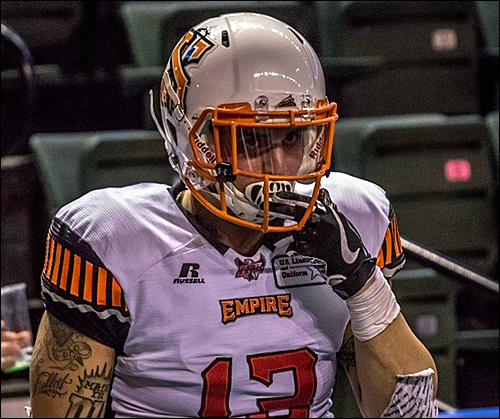 Empire LB Nick Haag on his tryout with the New York Giants. "I'm truly blessed. When something like this happens, you remember all those who doubted you and said you couldn't do it." Haag on his experiences with the Indianapolis Colts in 2015. "That's going to help immensely, just knowing exactly what's expected out of NFL guys as far as meetings and what practices are like. I'm going to try to make the most of the opportunity." May 12 - Colorado Crush (2-8) at Salt Lake Screaming Eagles (2-8), 6 p.m.
May 13 - Cedar Rapids Titans (1-10) at Iowa Barnstormers (8-2), 5:05 p.m.
May 13 - Sioux Falls Storm (9-1) at Green Bay Blizzard (2-9), 5:05 p.m.
Friday night's game is a homecoming, of sorts, for Arizona WR Anthony Amos. Like a large amount of Rattlers players over the years, Amos got his start in arena/indoor football with Spokane. After completing his collegiate career at Middle Tennessee State, he didn't generate a high amount of interest from any of the professional football leagues. In 2014, he had a tryout with the CFL's Montreal Alouettes and was cut by the NFL's Dallas Cowboys late in their training camp. An online notice regarding a tryout for the Spokane Shock in Atlanta, GA caught the attention of former Head Coach Andy Olson. He was assigned to the team in preparation for the 2015 Season. In his rookie campaign with the Shock, he began the season buried on the depth chart behind the likes of WRs Mike Washington, Nick Truesdell and Rashaad Carter. With injuries to Washington and Carter, Amos broke out as the Shock's go-to receiver. 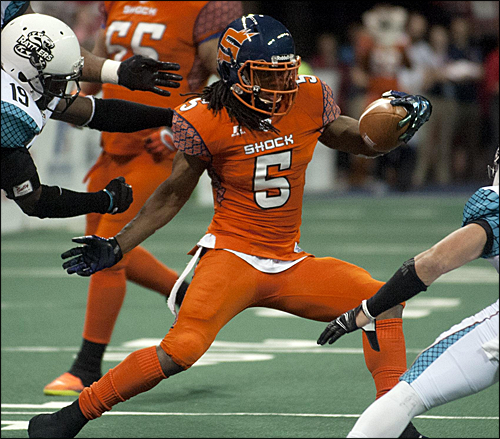 Despite six different starting QBs, Amos finished the season as the Shock's leading receiver with 110 receptions, 1,205 yards and 19 TDs. He led all AFL rookie receivers in the three major stat categories. In Week 17, Amos had a career game against the Rattlers. He caught a career high 13 passes for 144 yards and 3 TDs, highlighted by an amazing one handed catch from a misfired pass by QB Arvell Nelson, for an 11-yard score that put the Shock up 45-32 in the middle of the fourth quarter. 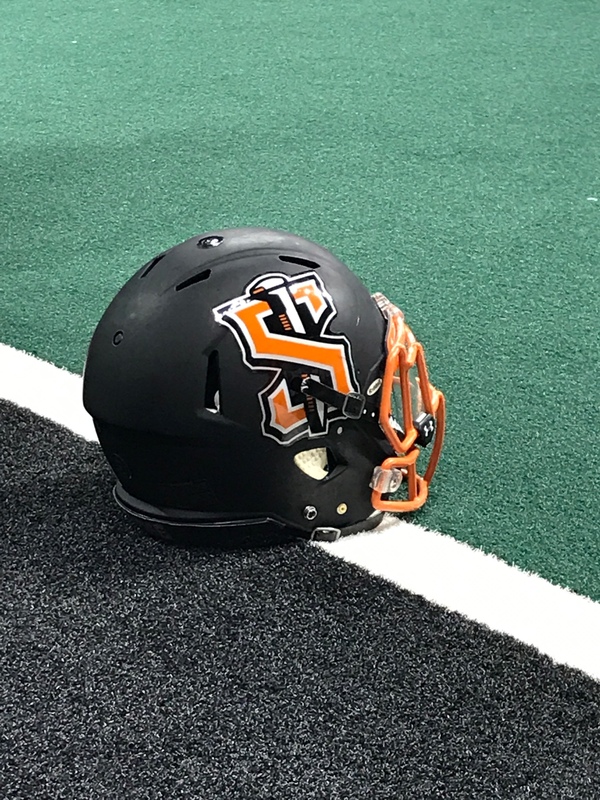 Spokane would defeat the Rattlers 52-45, and Amos was recognized for his performance, earning the AFL's Riddell Offensive Player of the Week honors. When the Shock made their move to the IFL, Amos was among many players who were dispersed to the remaining AFL franchises. He signed with the Arizona Rattlers for the 2016 Season. Amos had a relatively quiet campaign, catching 32 passes for 432 yards and 5 TDs. He would emerge in the postseason, making 18 receptions for 321 yards and 5 TDs. When the Rattlers moved to the IFL prior to the 2017 Season, Amos would eventually join the league he didn't go to the year before. He's the Rattlers' leading receiver, with 36 receptions, 440 yards, 13 TDs. This should be a great game. However with the inconsistency of both teams, it could be a not so great game. We shall see. The Empire could put themselves in a great position with a win tonight. Essentially a three-game lead including the tiebreaker. We're about to get started here. I'll be updating the stats and so forth. Big game for the Empire. Let's have some fun. Go Empire! Spokane won the coin toss and will receive. Candid pic of the engineer! Unfortunate Spokane could not come away with some points. Touchdown Rattlers. Darrell Monroe 4 yard run. Sawyer Petre kick. So did the Ratllers cut Darron Thomas? Efficient drive by the Rattlers. Touchdown Empire. Samuel Charles 15 yard pass from Charles Dowdell. Brendon Garcia kick.